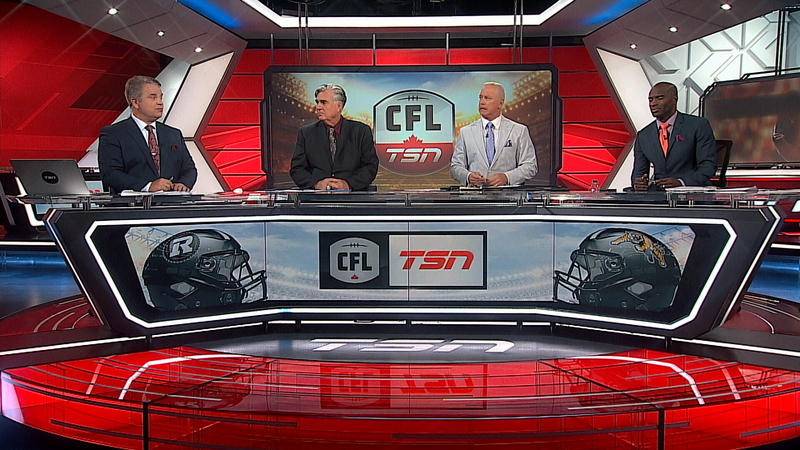 TSN no longer has football broadcast teams. It has a cult. The Cult of Johnny. Or perhaps it’s a church. The Church of Latter Day Frat Boys. Johnny Manziel being the Saint in Residence. Whatever the case, all the natterbugs on TSN football want to talk about is Johnny Manziel. So let’s talk about Johnny Manziel. He beat up a woman and threatened to kill her. Full stop. At least it should be a full stop, because once you’ve said a man has beaten up a woman and threatened to kill her, you’ve told me everything I need to know about that man. I don’t need to hear about Manziel’s frat-boy partying, the drugs, the booze and the skirt chasing. He beat up a woman and threatened to snuff out her life. And his life. ‘Nuff said. The shame is, the Canadian Football League ignores it. The Hamilton Tiger-Cats ignored it. The Montreal Alouettes are ignoring it. Ditto TSN and most mainstream sports media. The folks who repeatedly chanted “We want Johnny! We want Johnny!” at Percival Molson Stadium in Montreal on Thursday night ignore it. It’s as if Colleen Crawley doesn’t exist. Like she’s a fictional character in an Agatha Christie or John Grisham crime novel. But Crawley is very real. She’s the woman Manziel beat up and threatened to kill. No one in the CFL ivory tower has ever spoken to her about her night of terror, as Manziel raged and roughed her up. Nor has anyone at TSN. They don’t care about Colleen Crawley. All they care about is whether or not the Montreal Alouettes quarterback can throw a tight spiral. Johnny Frat Boy has yet to fling a football in a three-down game that matters, but that hasn’t prevented TSN and others from unabashedly glorifying him. If anything, it’s encouraged them to chatter more about the National Football League washout. 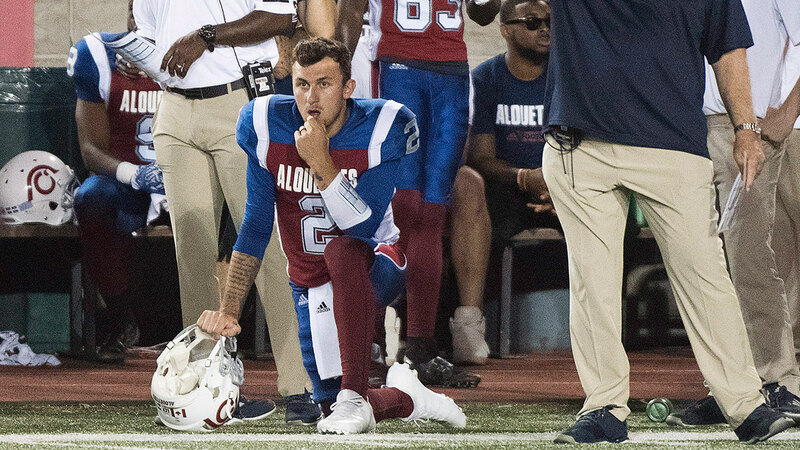 In the leadup to the Als-Edmonton Eskimos match on Thursday, the main TSN web page featured six Johnny Manziel videos on Tuesday morning. There were another four on Wednesday. Five more on game day. In the TSN pre-match nattering, ever-beaming host Kate Beirness and the panel—Henry Burris, newby Jim Barker and Milt Stegall—spent the better part of 25 minutes gasbagging about Manziel before even mentioning the Eskimos, who, oh by the way, rag-dolled les Alouettes, 44-23. By the end of the night, after Larks head coach Mike Sherman had displayed the good sense to keep Manziel confined to the sidelines, Beirness had wiped away her smile like faulty makeup. She was in distress, if not PO’d. It was as if her dog had died. I swear, I could hear a Merle Haggard hurtin’ song playing in the background. If TSN’s shameful fawning and obsessing with Manziel on Thursday didn’t turn enough stomachs, the boys were at it again the following night. Rod Smith and the three chatterboxes sitting to his left—Davis Sanchez, Matt Dunigan and Stegall—mentioned Johnny Rotten four times in the first two minutes (and five times total) during their chin-wag prior to the Winnipeg Blue Bombers-Tranna Argonauts joust. Color commentator Glen Suitor, meanwhile, felt obliged to talk about him toward the end of the match. Well, let’s file that under WTF. I mean, Manziel was 1,800 kilometres and two provinces to the east of Pegtown, most likely cruising Crescent Street in Montreal. So why was he part of the conversation? The TSN boys are acting like 1970s teeny-boppers waiting for a David Cassidy concert. Get a grip, for gawd’s sake. Manziel enablers and apologists might be interested in some disturbing, scary facts from the Canadian Women’s Foundation: Approximately every six days, a woman in Canada is killed by her intimate partner; in 2014, 80 per cent of the victims of police-reported intimate partner homicides were women; 80 per cent of dating victims are women. And one study, conducted between 2011 and 2014, found that domestic violence calls in Calgary were 15 per cent higher when the Stampeders played the Eskimos and increased to 40 per cent when the Stamps were in the Grey Cup game. But, hey, let’s ignore the facts and root, root, root for a guy who beat up a woman. Most asinine comment I heard or read about Manziel last week was delivered by Marc Dumont of The Athletic Montreal. He wrote: “Canadians can indeed be a forgiving people, finding empathy for those dealing with issues like substance abuse, but we rarely ignore incredibly serious issues like domestic violence.” Rarely ignore? I call total BS on that. TSN has been unrelenting and unapologetic in its campaign to get Johnny Rotten on the football field, completely disregarding the reality that he terrorized and beat up a woman. 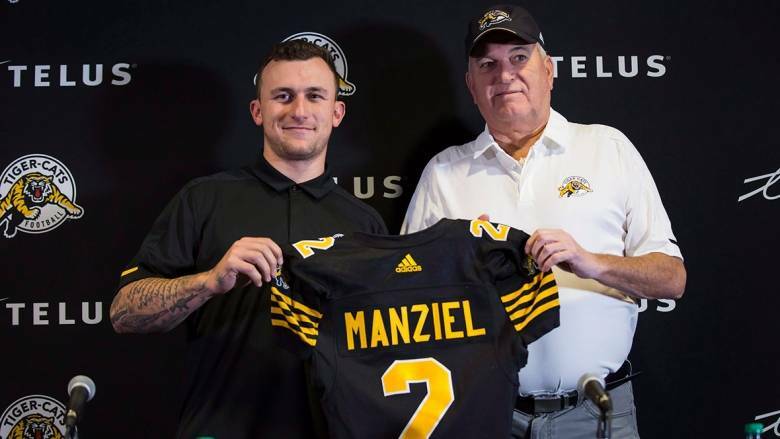 At Manziel’s intro presser after he signed with the Tiger-Cats, head coach June Jones shut down any conversation about domestic violence. And the Canadian sports media gave convicted woman-beater Floyd Mayweather a complete pass when he surfaced in the Republic of Tranna to tub-thump his farce of a fist-fight with Conor McGregor last year. 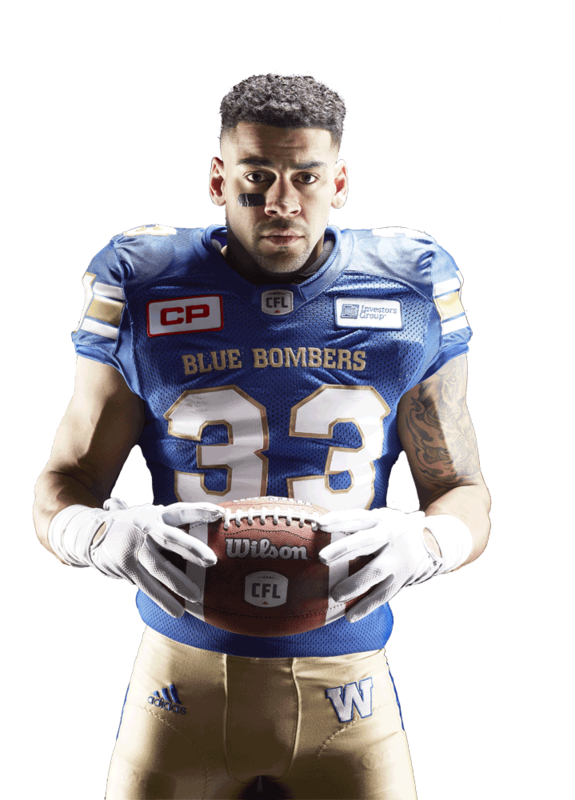 It’s not often that I lend an ear to podcasts, but Jeff Hamilton’s recent chit-chat with Winnipeg Blue Bombers running back Andrew Harris was definitely worth a listen. Hamilton, one of the CFL beat boys at the Winnipeg Free Press, asked Harris to weigh in on the Jacob Trouba saga, which resulted in the young Winnipeg Jets defenceman receiving a $5.5 million salary award from a National Hockey League arbitrator after contract negotiations ground to a halt. “Most players have an inflated vision of what they’re worth, and, in a sense, you should,” said Harris, who defected from the B.C. Lions to join Winnipeg FC in 2016. “You realize how much you put out there, how much work you put in, and all the things you go throughout a season and through a career. Ultimately, you want to get compensated for that. “You’re gonna get paid this amount of money for a short period of time, maybe 10 per cent, or 15 per cent, or 20 per cent of your whole life will be playing professional sports, so you’ve gotta maximize that to the full potential. But I think a lot of guys ruin a good thing after asking for too much money or going for places because they’re getting paid a certain amount when it’s not a good fit for them. A good fit within their system, within the community, within the lockerroom…it definitely can ruin a lot of careers just wanting more money or going where the grass is greener. Wiecek, who simply cannot get out of his own way when it comes to Trouba, says he’d “respect” Trouba if he went public and admitted he wants out of Winnipeg. Ya, like earning a news snoop’s “respect” is high on any pro athlete’s to-do list. There’s a basic reason why the jock-journo relationship is often adversarial—they don’t trust each other. And they don’t trust each other because they lie to each other. All…the…time. 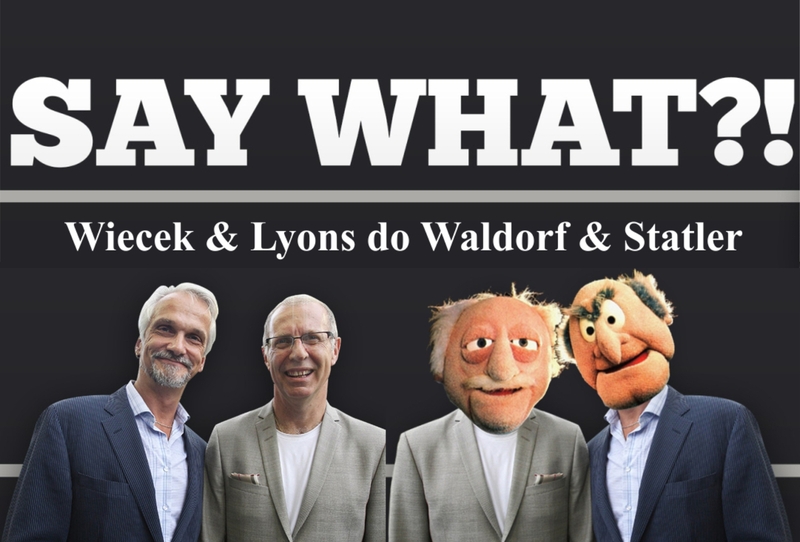 Yes, sports scribes also live on Planet Pinocchio. They don’t fib as often as jocks, but they bend, stretch and twist the truth like a blob of silly putty in a White House press secretary’s hands. The athlete-media dynamic was another of the topics Hamilton and Harris discussed during their The Handoff podcast. “I’ve definitely been misquoted,” said Harris. “I’ve been misquoted for sure. There’s a guy in Vancouver—he doesn’t work in the business anymore…he’s swimming with the fishes now.” He was joking. I think. 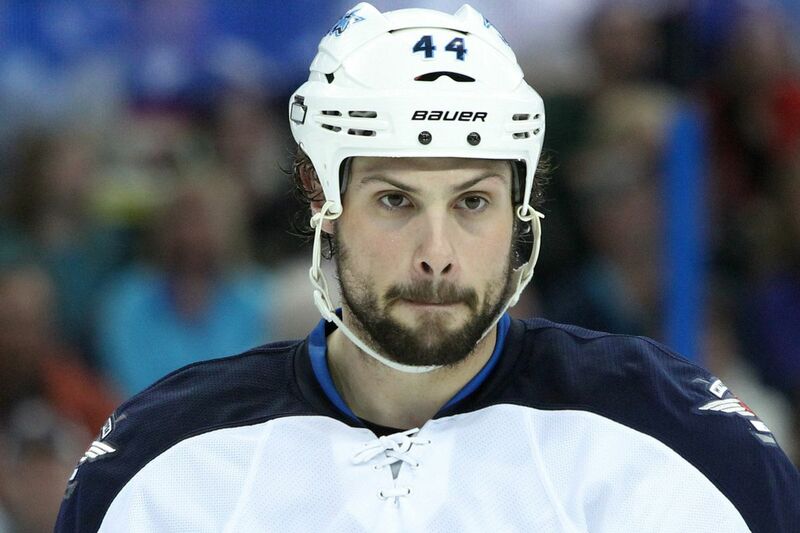 Would anyone out there in Jets Nation welcome a Jacob Trouba-for-Zach Bogosian swap even-up? Didn’t think so. I doubt Puck Pontiff Mark Chipman and general manager Kevin Cheveldayoff would either. Yet they agreed to give an underperforming Bogosian a seven-year contract with a $5.1-million cap hit in 2013, then placed a value of $4 million on Trouba nine days ago. That simply doesn’t add up. I mean, if they believed Bogosian was worth $5.1 million to them five years ago, they have to believe Trouba is worth a whole lot more in 2018. Naturally, we don’t know what numbers les Jets presented the Trouba camp prior to their recent arbitration hearing, but anything less than $5.1 million would have been highly objectionable and insulting. And people think Trouba’s the bad guy? Marko Dano has signed with the Jets for $800,000. Nice gig. Sit in the press box, watch 82 hockey games, eat popcorn, collect 800 large. That’s almost as much as a beat writer at the Free Press makes. The least Dano could do for that kind of coin is file a game story and sidebar. On deadline. Also gain about 40 pounds and wear wrinkled clothes that don’t fit. Then he’d feel right at home with the rest of the boys on press row. Hey, I’m not saying news snoops are slobs and shlubs. Some of them actually own neckties. They just don’t know how to tie them. 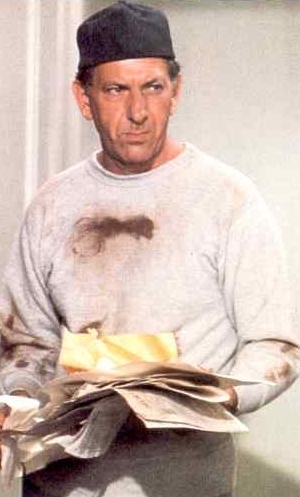 If you ever watched Jack Klugman or Walter Mathau as Oscar Madison in The Odd Couple you’ll catch my drift. (Am I showing my age when I use the term catch my drift?) The only news snoop I ever knew who belonged on the cover of GQ was George (Shakey) Johnson. To my knowledge, the only way to make the text darker is to bold face the entire column, and I can’t do that because I use BF to emphasize the initial few words that separate each of the thoughts. I shall look into it, though. Cheers. no. ‘catch my drift’ didn’t do it. it was the Agatha Christie reference that nailed you. You mean young’uns don’t know about Agatha?